A few weeks ago, our sermon text was Genesis 18:1-11, the story in which Abraham is visited by three mysterious guests. The text of Genesis is very clear: these were not simply ordinary guests, but in this encounter, God appeared to Abraham. This is very unusual, because throughout our scriptures, God does not make a habit of appearing to individuals. When God does show up, it is usually in the Old Testament, and even then the form used in Genesis 18 is unique. Only here does God reveal himself to someone in the form of three people. Early Christian theologians jumped on the number “three” and concluded that this was an appearance of the Trinity in the Old Testament. They suggested that the three men could easily be the Father, Son, and Holy Spirit. The History Channel’s recent miniseries The Bible even portrayed this story with three actors, one of whom – though his face was always hidden from the camera – played role of Jesus later on in the program. (Remember, our church has a DVD copy of this series which you may borrow any time!) However, finding the Trinity in Genesis 18 is an example of “reading into the text” – that is, making scripture say something that it doesn’t intend to communicate. 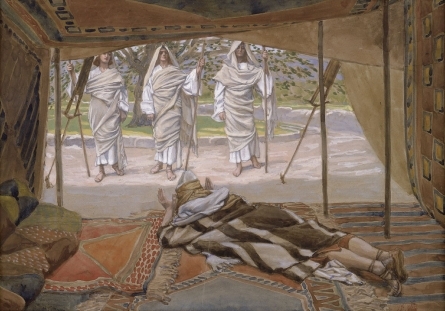 I am not theologically thrilled that The Bible miniseries used the actor who played Jesus to be one of the three guests who visited Abraham in its portrayal of this story. However, I am thankful that, at the very least, he was obscured from our view during that scene. Let us always remember that we do not have God figured out. God is a profound mystery, one who chooses to reveal himself to us in specific ways for specific reasons. Let us lean into the obscurity of the Bible’s stories, because through obscurity we are reminded of how great and mysterious God is.